Pride and Prejudice and Zombies sounds like an incongruous title. Up there with Apocalypse Snuggle, perhaps. Or Lock, Stock, and Two Smoking Doilies. 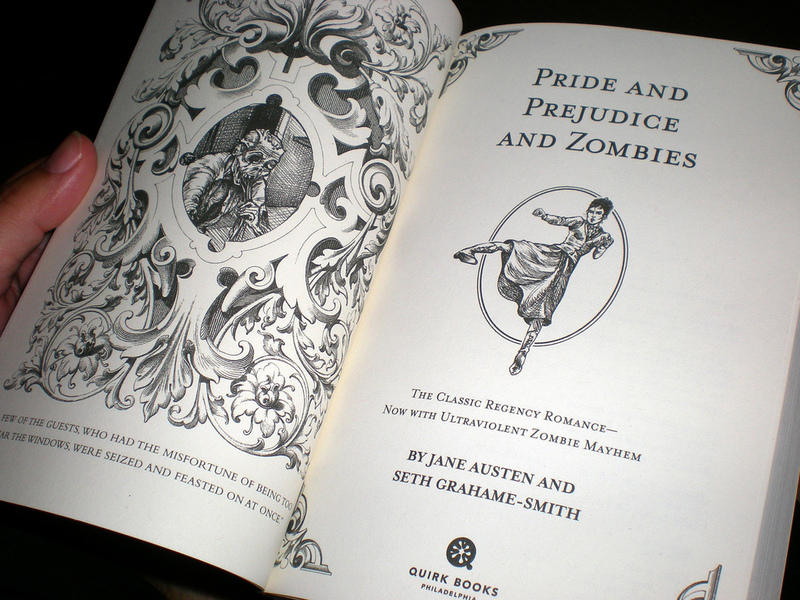 But on second thoughts, the combination of Austen and zombies might make more sense. Austen is, in some senses, a zombie author. She’s been reprinted, adapted, filmed, franchised, merchandised and monetised in so many ways that it can be difficult to see the original works inside the crowd of different versions. The corpus (or should that be corpse…) of Austen has been reanimated for a host of purposes which render her almost unrecognisable. The shrewd analyst of money and power is co-opted for a book of dating rules. The ironic observer of emotional folly is recast as a champion of teenage romance. Austen’s portrait, retouched and airbrushed, smiles eerily at us from the covers of ten thousand versions as they lurch across the cultural landscape, all claiming to be Jane. But the zombie factor is part of the pleasure which this particular reanimation offers. The gap between the Austen whose novels we know, and the grinning grotesquerie of Pride and Prejudice and Zombies, is where our reading happens. We trace the beloved text’s features, and recoil in delighted fascination when they disappear into the murk of horror, as they become both cosily familiar and grottily strange. Lines that we know so well, that we’ve mouthed a hundred times, twist and rot into unexpected shapes. Standing before us is both the Austen we adore, and some scuzzy imposter. And aren’t we partly to blame? Haven’t we been complicit in a multitude of past reanimations? Haven’t we bought the mugs, the diaries, the DVDs, the guided tours, the various Bridget Joneses? When Austen’s works were reduced to their constituent pieces of text, passed round without her animating and ironic spirit, when quotations appeared on tea-towels and calendars, when we put Sense and Sensbility memes on Twitter, we gave our sanction to this process. More than that, we lent our help. We shuffled round murmuring the lines, nicknaming each other by the characters, twisting the corpus gleefully out of shape. As the Austen zombies stagger all around us, are we ready to recognise what we have become? Pride and Prejudice…and Us? Blog by Dr Jem Bloomfield, Assistant Professor in Medieval and Early Modern Literature in our Faculty of Arts. Image credit: Kevin Harber on Flickr. Watch the trailer for Pride and Prejudice and Zombies below. But not if you’re squeamish.